Photographer Fred Lonidier—an alumnus and professor emeritus of UC San Diego's department of visual arts—is among 103 artists whose work has been selected for inclusion in the 2014 Whitney Biennial. Described by the New York Times as "America's most closely pored-over show," the 77th Biennial is on view in New York City March 7 through May 25. Two other artists with ties to the university's visual arts department also have been chosen: photographer and alumnus Allan Sekula, who died last year, as well as painter and former visual arts lecturer Laura Owens. Lonidier will have two documentary photo/text installation art works in the Biennial, both drawn from his critical explorations of sociopolitical conditions. #16A/B, 'N.A.F.T.A...' Returns to Tijuana,/'T.L.C... Regresa a Tijuana (2005) is a two-panel representation of censorship at the GaleriaTeatro, Universidad Autónomia de Baja California in Tijuana in 1999, and the subsequent display of the art in 2003 by Lonidier who exhibited the work on the inside of a tractor trailer that they drove to various locations around the city. GAF Snapshirts (1976) consists of 32 T-shirts Lonidier obtained through a special offer by GAF, a manufacturer with “typical business interests and practices,” he said. Lonidier printed the shirts with his photos of typed note cards and other images from his research into GAF. Lonidier hopes his inclusion in the Whitney Biennial—together with his March show, The Health and Safety Game, at Maxwell Graham Fine Art in New York—will spark new interest from exhibitors and collectors and even expand showings of his work within the labor movement. He also hopes to encourage artists to take up the subject of social class and the labor movement. A number of Whitney biennials in the past have also featured artists with ties to UC San Diego's department of visual arts. 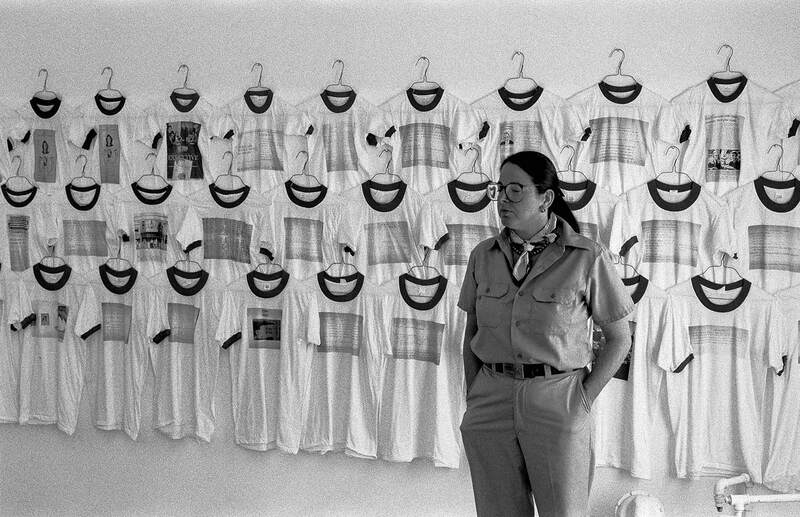 These include professor Babette Mangolte; professors emeriti DeeDee Halleck and Kim MacConnel; associate teaching professor Michael Trigilio; lecturer Laida Lertxundi; alumni Glenn Caino, Roman de Salvo, Carrie Mae Weems and Olav Westphalen; and Hugh Davies, adjunct professor and current director of the Museum of Contemporary Art, San Diego.